Suggesting that he’s mixed up a couple pages in his copy of the Unofficial Bullies’ Playbook, Montana congressman-elect Greg Gianforte has apologized to a journalist he body-slammed during his election campaign, offering to make an apparently irony-free donation to the Committee To Protect Journalists as a way of making amends. Gianforte attacked Guardian reporter Ben Jacobs last month during a campaign event; according to NPR, he “grabbed Jacobs by the neck with both hands and slammed him into the ground … then began punching the reporter” after Jacobs approached him during an interview with questions about health care reform. At the time, Gianforte’s camp stuck to standard playground supremacy rules, releasing a statement that blamed Jacobs for his own injuries, essentially initiating a very public game of “Stop hitting yourself!” on the national stage. 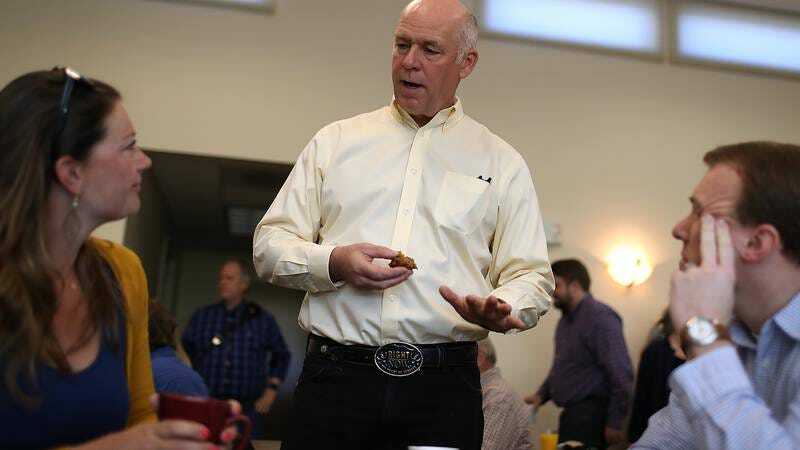 Gianforte did issue an initial apology the day after, though, albeit in the middle of his victory speech for the special election, because Republican voters in Montana apparently love that sweet heel heat. Now, Gianforte—who’s also pleading no contest to the misdemeanor assault charge stemming from the incident—has offered Jacobs a full apology, writing a letter in which he states that the journalist “did not initiate any physical contact with me and I had no right to assault you,” and adding, “I am sorry for what I did.” For his part, Jacobs has accepted the apology, and promised not to bring a civil claim against Gianforte, who’s also pledged to make a $50,000 donation to the Committee, a non-profit that’s been referred to as “journalism’s Red Cross.” It’ll be interesting to see how Gianforte’s new constituents respond to his current contrition, though; after all, once you take a guy’s lunch money, it’s not like anyone expects you to just give it back.